It’s hard to believe how far flooring has come over the years. 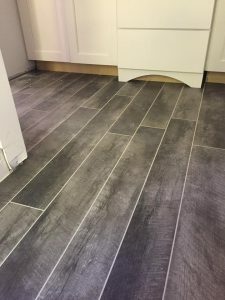 This may look like ceramic planks to the naked eye but it is actually a Luxury Vinyl Plank flooring. Pictured here we have installed Mannington Seaport Anchor planks with Biscuit grout in the master bath. With new looks and textures, products look very similar to real wood or ceramic tile!